Gently but thoroughly muddle cocktail ingredients with this unique bar accessory. The grooved nylon head works for fine mashing. 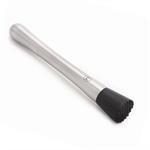 Try using the muddler to lightly bruise your fresh herbs before using to bring out their full flavour. First they are a muddler, allowing guests to crush and muddle their own cocktails. Secondly they are a straw for sipping their drinks. And lastly, the "fins" on the straws stir your drink. Each package contains 6 straws of different colours. These 13.8oz (410ml) 'HANOI' Cocktail glasses by Durabor are exquisitely designed for all your frosty drinks. This is a set of 6 with a heavy base for stability and superior break resistance. 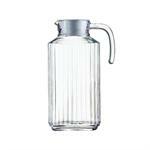 Shake it up and entertain your guests in style with this glass and stainless-steel cocktail shaker. 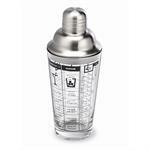 The leak-proof seal on the lid ensures no mess when vigorously shaking drinks. Includes ounce and millimeter markings on glass. Keep this flexible neoprene jacket in your freezer. 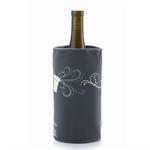 It is just the right size for a wine bottle and will keep it chilled for several hours. 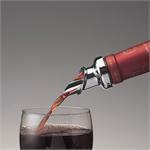 Prodyne's 2 piece pourer/stopper combination helps preserve the flavour and quality or your favourite vintage. The dripless-spout wine pourer stays in the bottle and the stopper with rubber base easily slips in to the spout to seal the pourer shut. Now you can have that true Margarita with your own Professional Glass Rimmer, just like the one at your favourite bar. 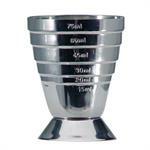 This 3 tier rimmer has 3 trays, each labeled for easy identification for lime juice, sugar, and salt. Just when you thought it was safe to get a drink of water... SHARK! 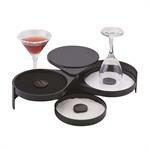 This set of 8 Shark Fin Silicone Molds are a fun addition to summer drinks. Fill them with a rainbow of flavoured gelatin or fill and freeze yogurt or pudding for a cool treat. 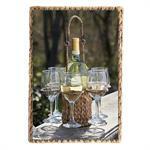 Set of 6 regular size are ideal for sipping water, juice, and sodas. 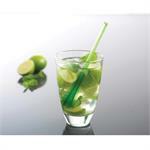 Keep the 4 pack of the larger smoothie straws on hand for your thicker frozen drinks, milkshakes and more. Both sets include cleaning brush and are dishwasher safe. Push the lever down and your favourite wine is sealed for short term storage. Simply lift the lever and the seal is opened for drip-free pouring. 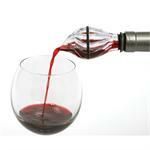 Pours evenly and consistently while being aerated as it flows out the wide spout. This wine aerator and pourer fits most wine bottles and speeds up the breathing process in the time it takes to pour a glass of wine. 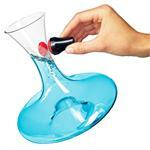 This can produce the same results as decanting, only much faster. Includes a stand and an extra gasket. 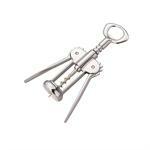 This heavy chrome corkscrew is simple to use. 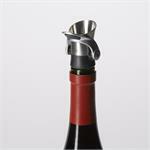 The wings rise up as you twist the screw into the cork of a bottle. Grasp the wings with both hands and as you press them down towards the bottle the cork easily slides out of the opening.